The little shop in Toad Lane, Rochdale, which the original Pioneers set up 160 years ago, is widely regarded as the home of the mighty Co-operative movement. 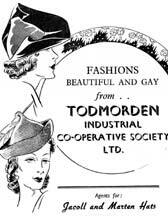 The roots of Todmorden Industrial Co-operative Society were laid in 1846, when a group of local factory operatives formed an organisation in protest against the rocketing price of flour and other foodstuffs. A joint stock company was set up in 1850 opening a small store in York Street. A new store was established in Dale Street and in 1896 the society marked its Golden Jubilee. Down the road in Hebden Bridge Co-operation had also taken shape. Here, too, it took several attempts before a society was successfully established. The small cottage at High Street, Bridge Lanes, where Hebden Bridge Co-op members set up their first shop. Code no CT109. It was all thanks to a group of local men who had originally formed the American Society. A local mill owner, Joseph Holmes, travelling to Liverpool market in 1840 or '41, offered to buy a barrel of flour and sell it to the group. From that inauspicious start Hebden Bridge Industrial Co-operative Society was born. The society prospered, in 1863 purchasing and demolishing a row of old cottages at the bottom of Bridge Lanes where the society's first purpose-built store was established. The Central Premises, the jewel in the crown of Hebden Bridge Co-op, pictured in 1948 when the Centenary celebrations were under way. Code no CT020. 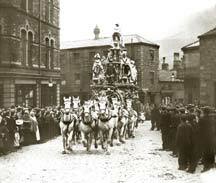 A precariously-loaded coach drawn by no less than nine horses, part of a circus procession, thunders past Hebden Bridge Co-operative Society's Central Premises, Crown Street. The building on the right is the White Horse Hotel, demolished in 1963. Date unknown. Code no TM085. The jewel in the crown - the magnificent Central Premises at Crown Street - was completed in 1889. 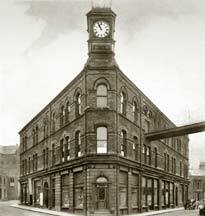 Todmorden Co-operative Society was also expanding, the impressive Dale Street premises, completed in 1883. The building comprised six shops with work-rooms on the first floor. But it was the public hall on the third floor, from the 1930s the famous Astoria Ballroom, which aroused the keenest admiration. The Co-operative Hall is still fondly recalled by many Todmordians, who danced and smooched the night away to the big band sounds of The Astorians and others! Sadly it all came to an end in 1961 when the ballroom closed. Six years later fire tore through the building, gutting the second and third floors. Celebrating their Centenary in 1948 Hebden Bridge Co-operators could have had little idea that for them, too, the writing was on the wall; the end - sudden and ignominious - came scarcely 20 years later. Neither society survived the retail revolution which transformed the 1960s. The full story is told in Issue 7 of Milltown Memories - and why famous soccer stars Stanley Matthews and Stanley Mortensen visited Hebden Bridge in 1948!